Removing and installing the oil pump is best done with the oil pan removed. However, it can be done by loosening the bolts on the oil pan and dropping the pan enough to remove the pump. With the oil pan still in place, it is difficult to apply sealant to the oil pump sealing surfaces and ensure a good seal is established when the pump is installed. However, it can be done. * Before you replace your oil pump, verify the part number stamped on the pump. There is a possibility that you may have an early oil pump on one of the later cars. I have a 1986 944 Turbo which had an original engine whose block was manufactured in 1985 and had an early oil pump. Place car on jack stands or ramps. Using ENG-13, set engine at TDC on cylinder number 1. Using ENG-03, remove the starter and install the flywheel lock (P9206). Using ENG-05, remove the balance shaft belt, timing belt, rollers, balance shaft sprockets, crankshaft gear, and rear timing cover. Remove the crankshaft gear Woodruff key from the crankshaft. If the oil pan is to be removed, refer to the applicable steps of LUBE-06 and remove the oil pan from the vehicle. Otherwise loosen/remove the oil pan retaining bolts as necessary to lower the front of the oil pan slightly. Remove the oil pump retaining bolts and slide the oil pump off the end of the crankshaft. Remove the oil pump drive gear from the pump. Inspect the drive gear closely. It will over time develop a ridge which will prevent proper sealing with the crankshaft oil seal. If a ridge is evident on the drive gear, it should be replaced. Remove the main oil pump seal from the oil pump housing. 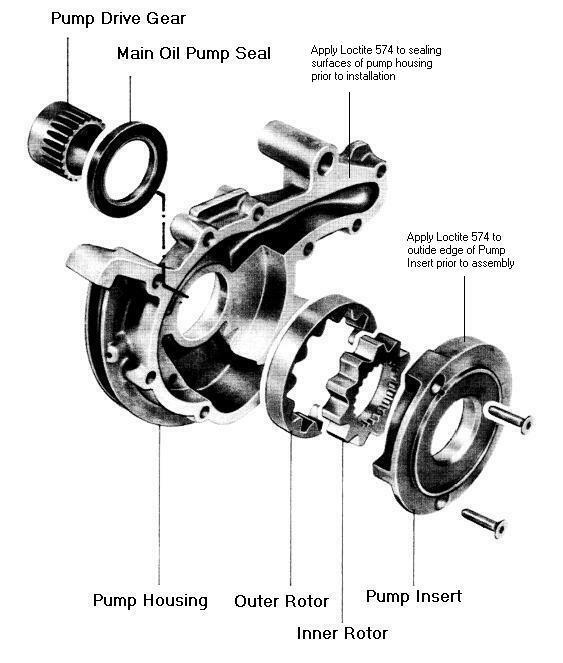 If the oil pump is to be disassembled for inspection prior to reusing, apply Loctite 574 to the outer edge of the pump insert during assembly. Install a new main seal in the oil pump housing and install the oil pump drive gear. Apply Loctite 574 to the sealing surfaces of the oil pump prior to installation on the block. Install the oil pump onto the block by sliding on to the end of the crankshaft and install the pump mounting bolts. Torque the M6 pump mounting bolts to 8 Nm (6 ft-lbs) and the M10 bolt to 45 Nm (33 ft-lbs). Install the crankshaft gear Woodruff key into the recess on the crankshaft. Using ENG-06 install the timing belt, balance shaft belt and all rollers. The belts are tensioned during the performance of ENG-06 using ENG-10. Install the air filter assembly (AF-01). Remove car from jack stands/ramps.